Facebook contests can drive huge fan growth over a short period of time and can make a massive impact to your Facebook page. Is this something you are running on a regular basis on your page? Do you want some ideas/inspiration for what might work for your brand? We reached out to some of the Facebook Contest providers who provide Facebook competition software and they each gave us one example of what worked really well for a customer that used their app. If you are thinking of running a Facebook competition for the first time, or are looking for some ideas for your next competition, then this post will certainly give you some food for thought. On a yearly basis Lilly Pulitizer sell really stylish looking ‘Agendas’ (Diaries) which their clients love. Each year they run a promotion campaign and this year they decided to use Heyo. They ran a Facebook contest to give away 50 Agenda’s. To enter the competition you had to register your personal details and e-mail, select your favorite Agenda and share out to your friends. A key part of this promotion was being able to enter it via mobile devices. Although Facebook Apps are not supported on mobile devices they have a smart solution. Clients that try to access the competition from a mobile device are automatically redirected to a mobile app where they can enter the competition. Client: Smart Shelters – Provide Storm Shelters Current number of Facebook Fans: 19,100 Competition Objective: Grow sales of their Storm Shelter product using Shortstack. 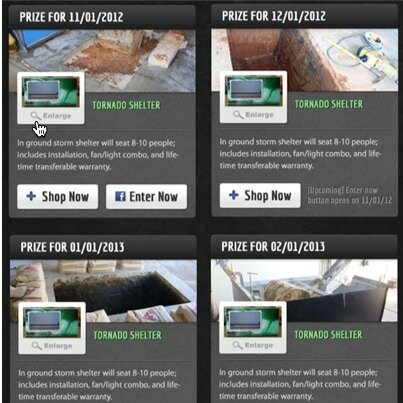 Smart Shelters ran a 12 month giveaway, where each month they gave away a storm shelter. 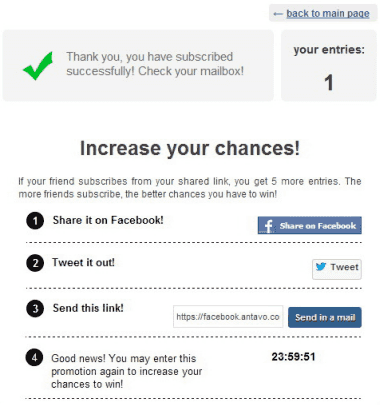 Using a customized version of shortstack they created an e-mail entry competition and supported the campaign with Facebook ads. The page started with only 800 fans and within 5 months went to 5,950 (they are over 19k now). There were 8,551 email submissions and 4,500 Facebook shares. Since launching the Facebook app they have generated over $750,000 in additional revenue for their products. Of course some of this growth would have happened organically but they believe the Facebook App had a key part to this growth. This competition provided something of real value so it was worthwhile running it on a monthly basis. As well as significant growth in email subscribers there was a large number of shares which helped build awareness for the products and also drive more email subscribers. 3. SocialAppsHQ – Brush Buddies gets their singer for their singing toothbrushes! Brush Buddies have a range of singing toothbrushes and they ran a competition to find the best singer that would be put on the singing toothbrushes! Using SocialAppsHQ they let people upload a video of themselves singing and the fans could then vote to find the best artist. Fans were also allowed to comment on the video uploaded and share it out to their social network. If there is a good enough incentive, your fans will upload videos and through a platform such as SocialAppsHQ you can run a really great video competition. Video is very engaging and the videos uploaded through the competition would have encouraged people to stay longer on the page which is beneficial to the brand. The Agorapulse petition app was used to collect names for a petition against inadequate housing. Each person that provided their digital signature were able to invite their friends to sign the petition and they also automatically shared the signatures with all their friends using Facebook Open Graph frictionless sharing. A leaderboard was created showing who got the most friends to sign the petition so this created the competition angle. The Facebook signature application was very successful at leveraging the viral potential of social media. On average, two out of six friends invited by the original signatory ended up signing the petition. 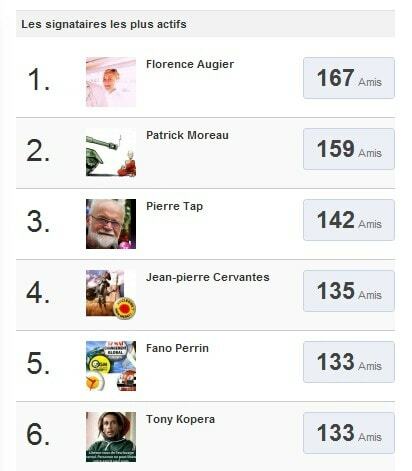 Some of the most active fans of the Abbé Pierre Foundation generated more than 150 signatures from their friends. A leaderboard can be very powerful and does not need to be tied to a prize. People like climbing the leaderboard and this is a strong incentive to do more sharing. Consider how you could introduce a leaderboard as part of your competitions. The frictionless sharing feature used within this competition also helped to build awareness of this campaign. Agorapulse has some nice functionality and is worth considering. 5. Voices Heard Media – Nature Clean, clean up on Facebook! A competition based around a survey and sweepstakes app was created which users could enter via their mobile device or through their desktop. They had to complete a survey and provide their details to enter the competition. 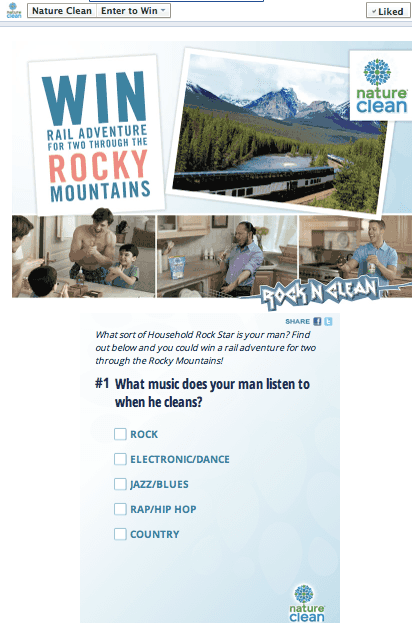 The survey and sweepstakes were targeted to women but the questions were based around the cleaning behavior of household men, bringing a humor and fun element to the competition ! The campaign ran for a total of 3 months, in which time the survey/sweepstakes was shared nearly 700 times. The Facebook tab where the campaign was held had over 50,000 visitors, of which over 40,000 took the survey and entered into the sweepstakes. A competition app can be a great way of building up profile information on your target audience. Consider what questions you could ask to survey your audience, but try to have a light-hearted/fun angle to the questions so people don’t mind filling it in and more importantly are inclined to share it with their friends. Client: Petopia Pet Store – Current Facebook Fans: 33,700 Competition Objective: Collect relevant email subscribers, increase fans and gather research . Petopia’s used a variety of Tabsite applications to grow their fan base. 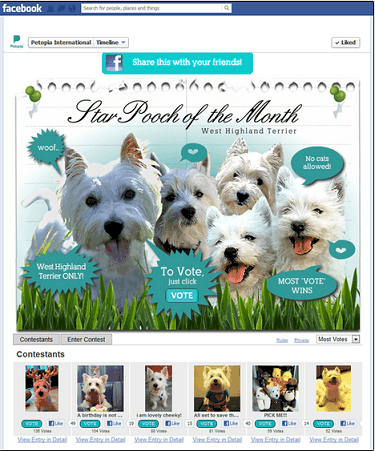 One of the competitions was to find the Star Pooch of the month and this involved the use of Tabsite’s 2 stage voting feature. Fans voted and then a subset of the top entries were put through another voting round. Petopia increased their fan count by 10,000 fans, going from 13,500 to 23,500 fans in less than 2 months. Voting can be a great way of increasing engagement and growing your fans (if you fan gate your content). A second round of voting keeps the momentum going! Client: JBL Electronics : Electronic Goods Current Facebook Fans: 1 Million Competition Objective: Build awareness of a new set of headphones! 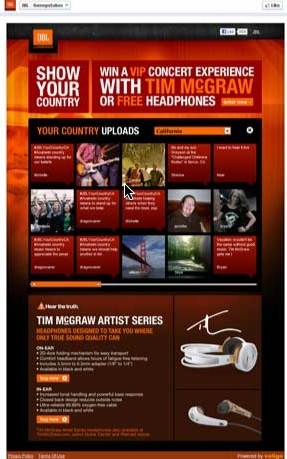 A custom sweepstakes app was created using Votigo that allowed users to upload photos, video and text to a variety of media channels that reflected what country music meant to them. Fans could use either Facebook, a microsite, Twitter or text message to enter the competition. All entries were put into the app gallery with Instagram and Twitter entries were identified using the campaign hashtag. The promotion also had a mobile app so entries could be uploaded from mobile devices. The prize was a VIP concert experience with country singer Tim McGraw and two tickets to the show or a free autographed pair of Tim McGraw Artist Series headphones. Summary There are many platforms your customers are on so being able to run the competition across a variety of platforms simultaneously is extremely useful. 8. Strutta – Getting Married with Strutta Apps! 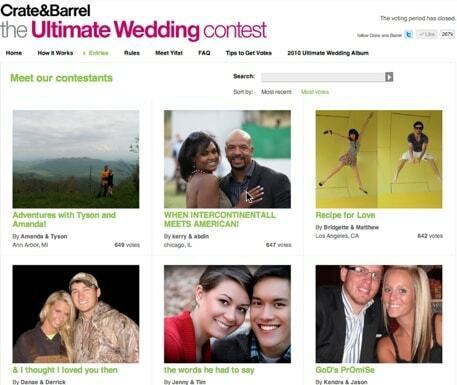 The contest was promoted across all channels: such as Crate and Barrel’s websites, press releases, online advertising, through direct e-mail and blogger outreach, as well as in-store displays. Individual stories generated from the contest also gained coverage in local papers, media and blogs across the country. 16,000 couples shared their love story! Getting your potential clients to upload photo’s and having a voting element can really work. As soon as they upload they then tell their friends and try to get as many votes as possible. Having your customers promote the competition for you to their friends and family can be the most cost effective way of promoting a competition. 9. EasyPromos – 50,000 Fans in 10 Hours! 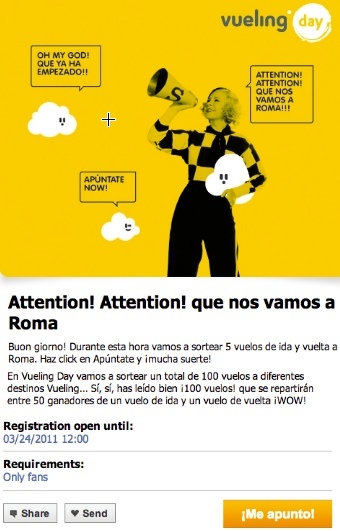 On the 24th March Vueling organized the ‘Vueling day’ where they ran a promotion on Facebook using EasyPromos for 100 giveaway flights. Starting at 9 am for 12 hours there was a new destination announced every hour. 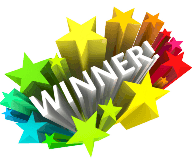 A simple sweepstakes was run but as part of the Sweepstakes the more friends you invited the more entries you could make to the competition. This made the sweepstakes go viral and new fans were converting at 1 per second. There were different promotions run within Easypromos for each destination and they kicked off automatically. It took less than 30 seconds to enter the promotion. Vueling had access to the list of participants real-time so they could announce the winners of the last promotion within minutes of it ending. Any participants entering were asked about their home city so Vueling could learn more about their fans. 50,000 New Fans in 10 Hours! Encouraging your fans to share out your content to get more entries to a Sweepstake can have an amazing effect to the results of your competition. Think about how you would get your fans to share! 10. 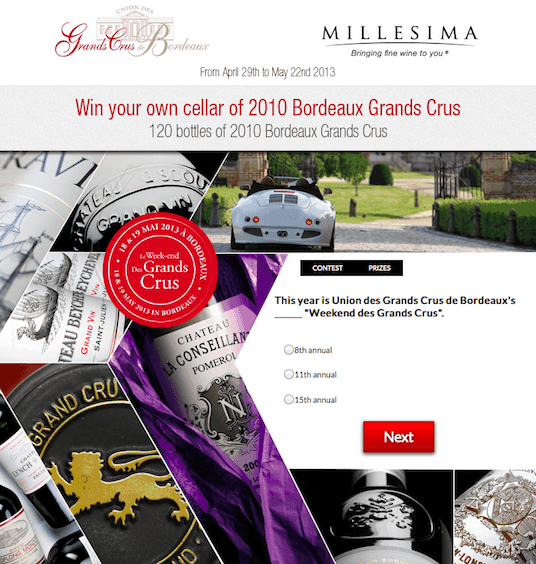 Kontest – Win some Bordeaux wine with a quiz! Millesima sell fine wine futures directly to consumers. They used Kontest quiz app for their promotion. There were 6 questions related to Wine and the quiz went on for 3 weeks. The prize was 120 bottles of 2010 Bordeaux Grands Crus + $2000 of vouchers valid for the purchase of Fine Wine. When they entered the quiz they opted in to receive further information about Millesima offerings. Facebook Ads were used to promote the quiz. An interactive quiz based around the product or service you are offering can be a great way of attracting relevant customers. Designers from around the world submitted their sketches to be reviewed by the Stitch team. The team selected 12 bag designs and from this then created a mobile optimized voting contest. The contest was embedded onto their website but to vote on the competition you had to log in via Facebook and share out details of the competition to your Facebook friends. The competition could also have been embedded on a Facebook page. This type of competition is great to get your fans or followers to contribute to your product design which ensures they are more likely to buy and/or share when the design is complete. The winning designer had the product designed in New York’s Garment District and is now available through the Stitch Collective online store. You vote on the design and the best designs get made! Wishpond’s Social Contact Database automatically captured the participants’ demographics, geographical details and contact information making it easy for Stitch to reach target groups of highly engaged potential customers with customized offers. 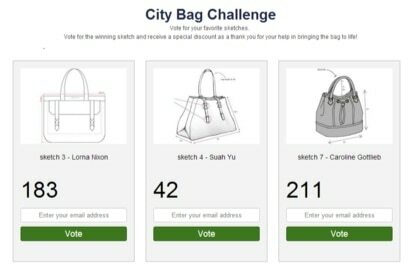 In less than 4 weeks, the City Bag Challenge received close to 4,000 votes, with the potential to be viewed by 2.5 million customers. Think about how you could get your customers/potential customers involved in helping you select new products or services. 12. Antavo – Innovative sharing for the Entertainer! They decided to run weekly promotions from Friday to Sunday using Antavo promotion apps. Every week there was a prize of a toy and to enter the competition you were asked a multiple choice question related to the toy (e.g. what is your favorite color for this toy). You then entered your e-mail address and following this you were offered an incentive for sharing to your friends. If you share out to your friends and one these friends also enter the competition you get 5 more entries. This is very smart because you don’t get anything for sharing, you only get benefit if there is action as a result of your sharing. Also, you are more likely to use all sharing options for a chance to win more entries and increase probability of winning. You had the option of entering the competition again by sharing out details to your friends! After 7 weeks running the competition there were 8,000 subscribers. The conversion rate from visitors to subscribers was 75.5%. The most successful promotion attracted 2,047 subscribers. Being innovative about how you encourage sharing is key to success of competitions. By having an incentive to share that will result in more entries to the competition, strongly encourages people to share. This worked for this Antavo competition! If Facebook competitions are run correctly with good applications and are sufficiently promoted, they can be extremely useful for your Facebook page. We’d love to hear about what any Facebook competition ideas you have or Facebook competitions you have run? To help make your Facebook contest more successful, we’ve made a bonus checklist of 21 steps to maximize the ROI of your Facebook contest. We cover tips like making sure more than 10% of your audience is actually seeing your posts, how to keep in touch with your readers after the contest, and more. Get the bonus by clicking here: Get Bonus!